A new report from the Thomas B. Fordham Institute identifies states and districts with high enrollment rates in such courses, which "warrants scrutiny"
More than two-thirds of U.S. public high schools enroll students in credit recovery programs, but almost 10% of those schools have at least a fifth of their students in these courses, according to a new analysis of federal data by researchers at the Thomas B. Fordham Institute. Those are the schools that “warrant scrutiny,” the report’s authors say, adding that, in general, states don’t define and monitor the quality of these programs in a consistent way. The report identifies the districts where at least 10% of high schools enroll 20% or more in credit recovery, including Grossmont Union High School District in California, the Houston Independent School District and the Phoenix Union High School District in Arizona. The review also shows that schools with at least 75% students of color are slightly more likely to have credit recovery programs. And that schools with higher proportions of poor and minority students, as well as urban and large high schools, enroll more students in credit recovery classes. While charter schools in general — along with other small schools overall — are less likely than district schools to offer these courses, charters that do offer them also enroll higher numbers of students in credit recovery than traditional and magnet schools. 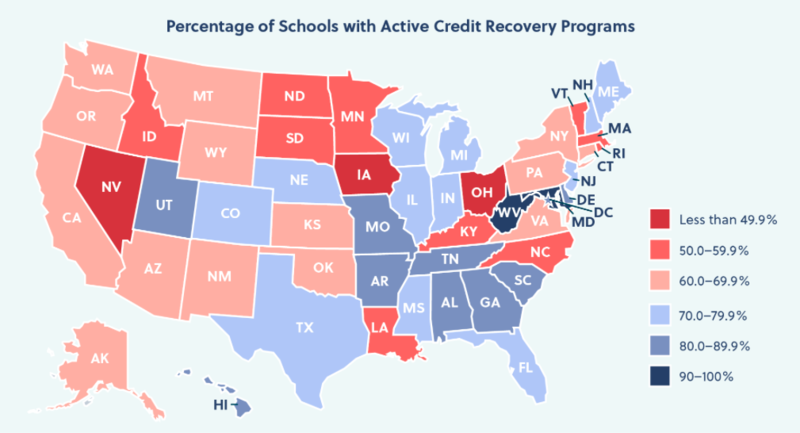 The map shows the prevalence of credit recovery programs, state by state. A 2017 Slate article called credit recovery programs “the new diploma mills” and said that the push to hold schools accountable for graduating a certain percentage of students has led many administrators to buy into using online credit recovery programs. And while graduation rates are increasing, many question whether credit recovery programs are helping districts game the system. “Students relying on [credit recovery] courses of questionable quality to graduate are being deprived of access to rigorous coursework while schools claim success in graduating students they didn’t educate,” the report’s authors write, adding that these courses might even increase the rates of students who have to take remedial courses once they enter college. An investigation last year by WAMU and NPR into graduation rates at Ballou High School in the District of Columbia Public Schools (DCPS) showed that some students were taking credit recovery courses without ever taking the actual course. Interestingly, DCPS is now working to finalize policies regarding the use of credit recovery programs, and WAMU recently reported that this year’s graduation rates have dropped slightly. Nat Malkus, the deputy director of education policy at the American Enterprise Institute, also released a recent report including state-by-state data on credit recovery. He notes that while graduation rates have increased, they have not been accompanied by increases in scores on the National Assessment of Educational Progress, the ACT or the SAT. “So, if rising achievement cannot explain them, these record graduation gains must flow from additional supports that schools are providing to students who might not have graduated without them in prior years,” he writes. A recent study appearing in the journal Educational Researcher noted that students taking online courses to make up algebra 1 end up earning about the same number of credits by the end of high school as those in face-to-face credit recovery programs, but that both groups are less likely to graduate in four years than those who passed the course in 9th grade in the first place. The researchers also recommended that schools carefully consider who they assign to such programs, noting that a student who is also chronically absent or getting in trouble might not benefit from an online course. Jordan Rickles, an education professor at the University of California, Los Angeles, and the lead author of that study, added in an email that the inconsistent way in which states define credit recovery programs makes it difficult to collect accurate data and identify high-quality programs. In the Phoenix district, students in credit recovery programs work in a "blended learning environment" with a certified teacher, who monitors how students are progressing before allowing them to continue to the next stage of the course, Curriculum Director Brian Corte, explained in an interview. But he added that the district in general is focusing more on how to use "concept recovery" for standards that students are missing while they are still in the original course and discussing practices regarding when students can re-take assessments or take alternative assessments. "Often what we’re finding is kids are so close to getting the concept, they just need a little bit more," he said. The authors of the Fordham report also note that there are some ways states can improve monitoring and specify the situations in which students can be assigned to credit recovery programs. Alabama and Tennessee, for example, require students to earn a minimum score in the original course before being allowed to use a credit recovery program. That way they “aren’t starting from scratch,” they write. And if they don’t reach that minimum, they retake the original course. They also recommend that states and districts collect and report better data on the use of credit recovery programs, such as how many courses a student is taking and what percentage of credits are accumulated through credit recovery. And they urge states to fully vet online programs and still require students to take the same end-of-course exams as their peers in traditional courses.